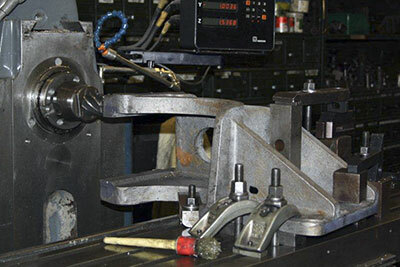 All six driving wheels have been cast and are now at various stages of machining and inspection. 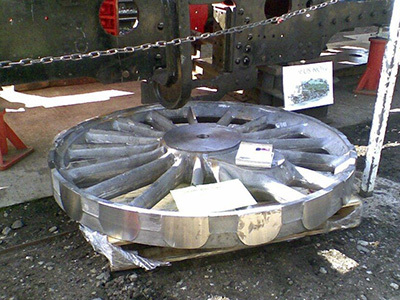 The Boro' Foundry very kindly sent a wheel over to Bridgnorth for the Autumn Gala to be positioned next to the chassis and form a conversation piece. The frame stretchers at the rear end of the chassis have been removed and work on cleaning all the joint faces is in full swing. It is hoped to re-install these stretchers as soon as possible and proceed with reaming the rivet holes. Some of the front end footplating has been refitted and painted. The lengthy process of machining spring brackets draws towards a conclusion with axleboxes soon to be jockeying for position. Manganese liner plates, laser cut to size, for the axleboxes have been delivered. However in the meantime boring of the holes in the fork ends of the cross stays has started with attention currently focused on the area of the leading axle. Chris's little aside in the September Newsletter, suggesting that someone might like to kick-start the Boiler Appeal in advance of its formal launch in the Spring, has resulted in three members coming forward with generous donations, all of which can be Gift Aided. What a great start, and even before the Appeal is launched! Thank you so much to the gentlemen concerned, and if anyone would like to emulate their example, please do get in touch with Chris: there is a dedicated bank account all ready and waiting. This will be our last major appeal, and we are keeping our fingers crossed that it will be as successful as the Wheel Appeal has been. Certainly, we seem to have hit the ground running, so let's hope we can keep up the momentum and get that boiler built as soon as possible. In the meantime, we are on the brink of some really terrifying spending, with the driving wheels and wheelset assembly, the pony wheels, and the cylinders, all in the pipeline and needing to be paid for over the next half year or so. 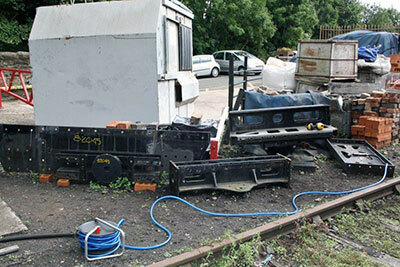 All is well, though, and we should be able to show the world a rolling chassis, with cylinders fitted, by next summer. The RCTS magazine The Railway Observer will, we hope, be featuring an article about the 82XXX tanks and the 82045 project in its November issue. The editor has kindly allowed us to include an appeal insert in the magazine (circulation approx 3,000), so Chris has done a quick update to our latest leaflet, pending a complete redesign for the Boiler Appeal early in 2014, and we are hoping to recruit some new supporters as a result. Again, fingers crossed! One of 82045's new driving wheels was introduced to the chassis for the duration of the SVR Gala and proved to be a very popular attraction. Photo: Barbara Massau. 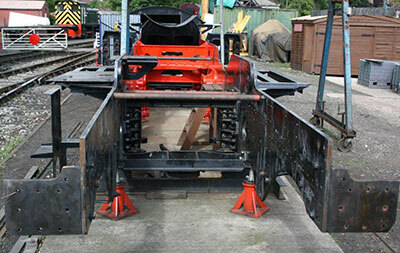 The rear end of chassis with most of the stretchers removed for joint face cleaning. Photo: Tony Massau. The various frame stretchers on the ground receiving the joint face cleaning treatment. Photo: Tony Massau. One of the frame cross stays prior to boring of the holes in the fork ends. Photo: Tony Massau. 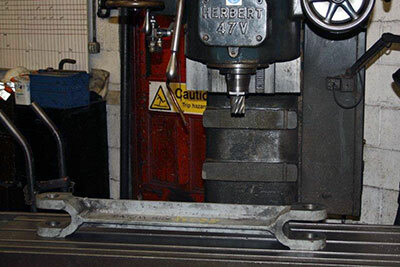 A spring bracket undergoing a milling operation. Photo: Tony Massau.